De-Annexation: It Came From Nashville! The dreaded de-annexation bill got sent back to committee, and Memphis lives to fight another day. Legislators, along with Council and County Commission members, protested the de-annexation bill last week. A funny thing happened on the way to the latest legislative effort to humble Memphis and put the city in its place. The effort itself, or, more properly, the legislators behind that effort, were the ones who got a lesson in humility and about the limits of power. This time. Nothing is impossible, and some variant of the de-annexation bill (HB0779/SB074) that set out to strip Memphis of a fifth of its population and an even greater share of its treasure may yet find itself thrust into the light of day. But surely not in its original form. In that form, the bill, the brainchild of two suburbanites from the Chattanooga area, state Representative Mike Carter (R-Ooltewah) and state Senator Bo Watson (R-Hixson), would go well beyond a measure passed two years ago by the Hamilton County duo. Their 2014 bill established for the first time the right of residents of areas eyed for annexation by adjacent cities to hold a binding consent vote on the matter. The new Carter-Watson bill was designed to go even further: It would allow the residents of any area annexed by one of five target cities since 1998 to de-annex themselves upon presentation of a petition for an enabling referendum by only one-tenth of their populations, followed by passage of the referendum by a simple majority vote. The consequences to Memphis if the bill were passed were estimated by city officials to be enormous, with potential revenue losses in property tax and local-option sales tax proceeds going as high as $78 million annually. Even the minimum estimate of $27 million acknowledged by the bill's proponents was staggering. And the city stood to lose a major hunk of its population — 110,000 residents, most of them taxpayers of some means — leaving behind a disproportionately poorer population in a city already hard-pressed to meet its basic service obligations. Strickland with media in Nashville last week. 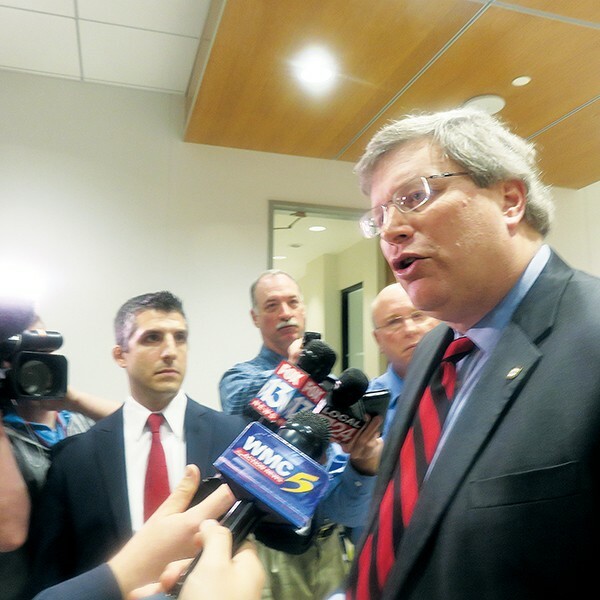 Mayor Jim Strickland, whose victory in last fall's city election was due in no small part to his pinpointing of the city's increasingly vulnerable circumstances, put it this way on a visit to Nashville last week: His city was already in fiscal crisis — facing $20-$40 million in various necessary upgrades for pensions, police and fire services, and the like. Memphis could lose another $15 millon annually if ongoing legislative efforts to abolish the state's Hall Income Tax should succeed. And the $27 million from de-annexation would be on top of that. 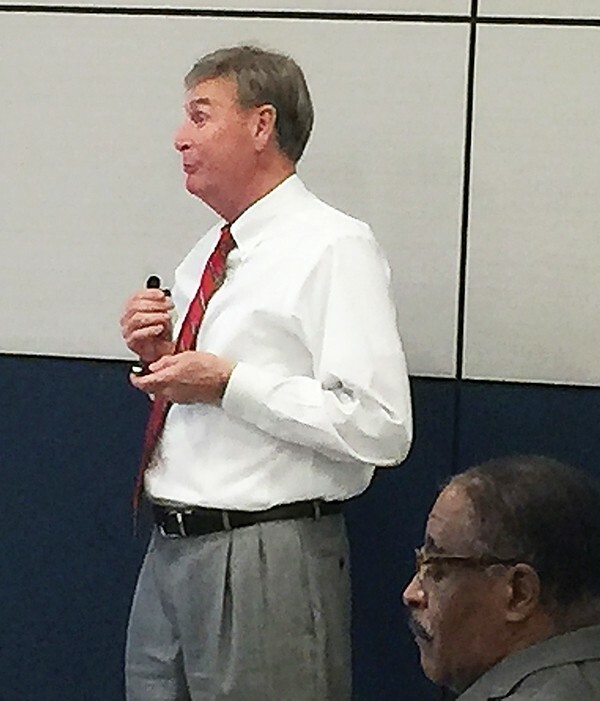 To be sure, the de-annexation bill had a provision that de-annexed citizens would continue paying taxes for a pro-rated share of general obligation bonds relating to the establishment of city services and capital improvements in their areas, but, as Strickland pointed out, there were other expenses that would be left uncompensated, relating to utilities, pensions, and OPEB (other post-employment benefits) obligations. Arguments of the same sort were put forth by those legislative members of the Shelby County delegation hailing from Memphis. Eventually they would have their effect, but not before last week's passage of the de-annexation bill in the state House by a convincing margin of 65 to 24. That was then, this is now. Memphis was not alone in its opposition, as was evidenced when the Senate, after taking up the bill on Monday, chose to send it back to the body's State and Local Committee for reconsideration. The countervailing forces to the bill are mounting, and they are by no means small-time. They start with Governor Bill Haslam, a former mayor of Knoxville, who had early on made known his misgivings about the bill — which are personal, institutional, and political all at once — and who does in fact have resources, including a veto power, capable of blunting or blocking the current bill. The governor is still keeping his own counsel on the matter of a veto, but, having made known his "concerns" about the de-annexation bill last week, made a point of repeating them at some length in remarks to reporters on Monday, acknowledging that other cities — Knoxville, Chattanooga, Kingsport, and (asymmetrically) tiny Cornersville — were also targeted. "As I said before," he reiterated, "I do have a concern about ... the impact on Memphis' finances." Also concerned, and publicly so, was Lieutenant Governor Ron Ramsey, the state Senate speaker, the man whom many see as the ultimate arbiter of hot-button issues in Nashville. 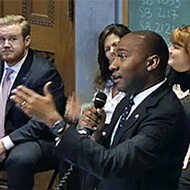 Ramsey, too, weighed in against the bill, and, pointedly so, on Monday morning, the very day of reckoning, when the bill was scheduled for the state Senate floor. He was opposed to the bill and would vote that way, Ramsey told reporters. He reminded them he had supported the 2014 measure establishing the right of consent for citizens in areas about to be annexed. 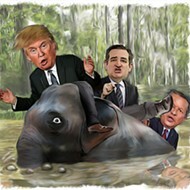 "We set a line in the sand that from this point forward, anybody that's annexed has the right to vote on this. But now we're reaching back to get those that were annexed, legally under the law, by contract." The lieutenant governor pointed out that there was already a way for residents to seek de-annexation if the annexing cities "are not fulfilling their plan of services." The new bill from Carter and Watson was therefore unnecessary, said Ramsey, admitting that he was further annoyed that the bill's framers had included Kingsport, from his own Senate district, in the bill without his foreknowledge. As Ramsey noted, the bill was not statewide in its scope. It was confined to five urban areas whose annexations of adjacent territories were labeled "egregious," a subjective word of dubious legal application that, on the face of things, makes the proposed legislation subject to charges of unconstitutionality. The bottom line was that the five targeted cities had all operated properly under the law. Whence, then, this allegation of egregiousness? 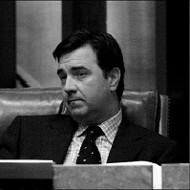 A little background: The current bill can be seen as an effort to nullify Public Law 1101 of 1998, a legislative action that was hailed in its time as a "great compromise" and that had stood intact until Carter and Watson began trying to dismantle it. Public Law 1101 was the product of unprecedented compromise and coordinated drafting efforts involving the state's urban, suburban, and rural interests. 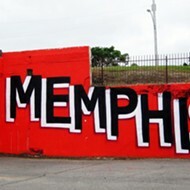 It directly followed upon the first major assault upon Memphis' annexation prerogatives, the so-called "Toy Towns" bill of 1997, soon to be renamed by Memphians as the "City Killer" bill. Toy Towns was a sleight-of-hand bill moved unobtrusively through the legislature in the 1997 session by longtime Senate Speaker/Lt. Governor John Wilder, whose intent was merely to facilitate an incorporation process for the newly established community of Hickory Withe, whose residents feared possible annexation by any one of several larger towns in Fayette County. It was a "caption" bill, whose formal description was opaque enough to disguise the fact that it would have established a ridiculously low population threshold, so that the tiny community could incorporate. To make a long story short, sharp eyes in suburban Shelby County noticed the new incorporation threshold and saw that it could apply universally throughout the state. Whereupon a frenzied race began to incorporate among literally dozens of neighborhoods on the fringe of Memphis that saw a way to avoid ultimate takeover by Memphis. Then-Mayor Willie Herenton, in perhaps his finest hour, resolved to challenge the Hickory Withe law and fought it all the way to the state Supreme Court, winning there, ultimately, and putting a halt to the proliferation of "toy towns" on the borders of Memphis. 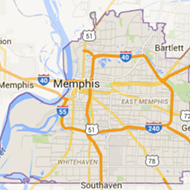 It was a defense not only of Memphis but of urbanism itself in Tennessee. The City Killer, a monster which would ultimately have threatened the integrity and strangled the growth potential of every city in the state, had been slain. It was not a one-sided triumph, however. The sequel was Public Law 1101 the next year, limiting each of the state's municipalities, including the several in Shelby County, to specific, restricted annexation reserves and establishing an orderly process for all annexations in the future. The peace was kept in Shelby County on the suburban front until the school-merger crisis of 2010-13, when, in the wake of a defeated city/county consolidation referendum in the election of 2010, the surrender of the Memphis City Schools charter presented the county's suburban municipalities with the prospect of automatic school consolidation and a threat to what they saw as a challenge to their integrity. The result was the Norris-Todd bill, which slowed down the merger process and ultimately allowed the suburbs the right to form independent urban school systems of their own. Then came the Carter-Watson bill of 2014, ensuring the principle of consent for an area about to be annexed. So far, so good. The balance of power between city and suburbs was being kept. Until 2016 and HB0779/SB074. It surely was a help to opponents of the Carter-Watson bill that eminences such as Haslam and Ramsey could be counted in opposition. 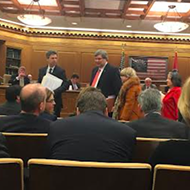 But the staving off of the bill in the Senate on Monday also owed much to the lobbying efforts in Nashville of Memphis City Council members, acting in coordination with a delegatgion from the Greater Memphis Area Chamber of Commerce and the Strickland administration. As Chamber head Phil Trenary said, "We all were aware of each other's efforts and worked together, talking to as many senators as possible. We were told when we got here that we had a maximum of nine votes in the Senate against passing the bill. We managed to get that up to 19." 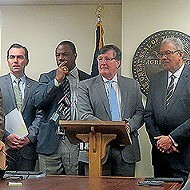 The collective lobbying effort, Trenary said, had essentially been a matter of convincing the legislators that the bill threatened the financial health of Memphis and that what threatened Memphis financially was also menacing to the fiscal and social health of Tennessee at large. The council members who contributed to Monday's lobbying effort were Kemp Conrad, Worth Morgan, and Philip Spinosa, all members in good standing of the same military-industrial-chamber-council complex that partisans of the Overton Park Conservancy and the park's Greensward were uttering not-so-tender things about just two weeks ago, when the council passed a resolution giving Memphis Zoo management control over the Greensward space. Okay, the military-industrial reference is tongue-in-cheek, but it already seems clear that the city council elected last year — with much support, financial and otherwise, from the city's business elite — is capable of organizing collective operations a) on behalf of an agenda that the majority perceives as being in the interests of Greater Memphis and b) in opposition to efforts by others that run counter to that agenda. And dismembering the city and pillaging its revenue base is definitely counter to the Memphis agenda. Mindful, no doubt, of the historic Memphis-Nashville rivalry and of the fact that "Nashville" is used symbolically (as in the headline of this article) of efforts, often confrontational to Memphis, arising from state government, Trenary made a point of noting the helpful efforts behind the scenes of business and government leaders in Nashville in the fight against the de-annexation bill. Members of the Nashville legislative delegation were also active, along with their Memphis counterparts, in resisting the bill. And the actual mechanism that took the bill off the Senate floor and staved off a floor vote on Monday came on a motion by Senator Ken Yager of Kingston, chairman of the body's State and Local Committee, who found the version that passed the House last week to be "totally unacceptable ... bad law and bad policy." 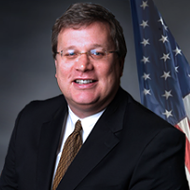 Yager based his objections mainly on the bill's singling out of five cities of the 350 or so municipalities in Tennessee and its use of the hazy term "egregious" to describe annexations by those cities. After Senate sponsor Watson quarreled with that judgment and after a good deal of ensuing to and fro in debate, the Senate agreed to suspend the rules and refer the bill for reconsideration to Yager's committee, which scheduled it for a specially called session on Wednesday at noon. 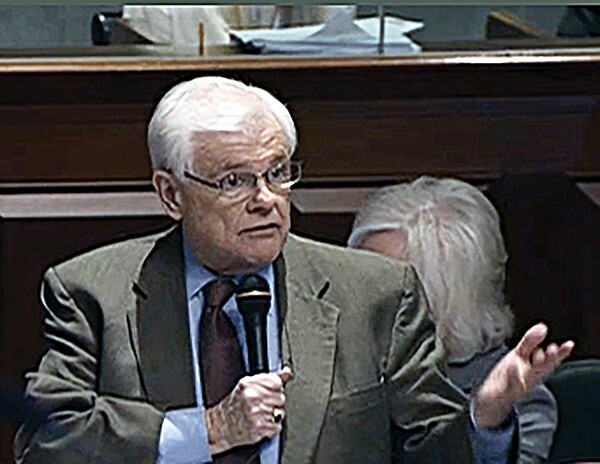 After the Senate vote, Trenary expressed the hope that deliberations on the bill might continue beyond Wednesday, given what he reckoned were a great number of people, not only from Memphis but from elsewhere in Tennessee, who would presumably want to offer testimony relating to the potentially harmful consequences of the de-annexation bill. The bottom line is that this latest monster to arise out of state government to menace Memphis has been contained but not yet eliminated. 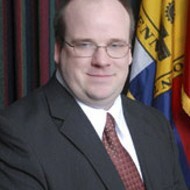 Rep. Curry Todd of Collierville was a leading bill proponent. Not everyone perceives the de-annexation bill to be a monster, of course. 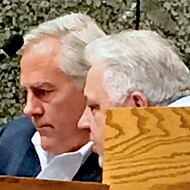 Among the partisans of the bill who spoke for it in the House last week were such suburban Shelby County representatives as Mark White of Germantown and Curry Todd of Collierville, both of whom, like Carter and Watson, see the measure as constituting justified redress for citizens who never got to vote on their annexations. 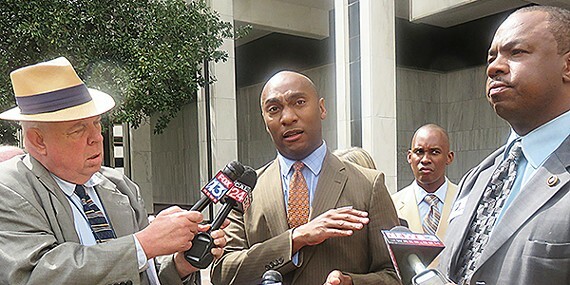 In an exchange with Strickland on the matter during the mayor's appearance before a lunch of the Shelby County delegation at Tennessee Tower last Wednesday, Todd alluded to purported behind-the-scenes negotiations between representatives of the city and proponents of the bill that would have confined its application to the areas most recently annexed by Memphis: South Cordova and the Windyke-Southwind area. Senator Yager putting the brakes on de-annexation bill. In a later Q and A with reporters, Strickland seemed to acknowledge the prior existence of such negotiations. "It was our understanding that the bill would just affect those two areas," he said, and he went so far as to state, "I would agree to those two if that would resolve the issue." 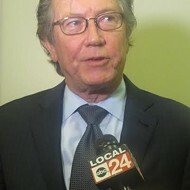 Trenary, too, said that re-casting the bill in that form might be one acceptable way out of the current confrontation, although there remains strong sentiment, both within the Memphis legislative contingent and the city council, against any concessions at all on areas already annexed by the city. In any case, it ain't over 'til it's over. And, as of this writing, the issue of the de-annexation bill, though stalled, has not reached the final stage. Matters could be resolved to everybody's satisfaction. And if not? Beyond what the legislature decides to do is the prospect of a gubernatorial veto, if the bill remains offensive to Haslam — and the near certainty of a long round of litigation.